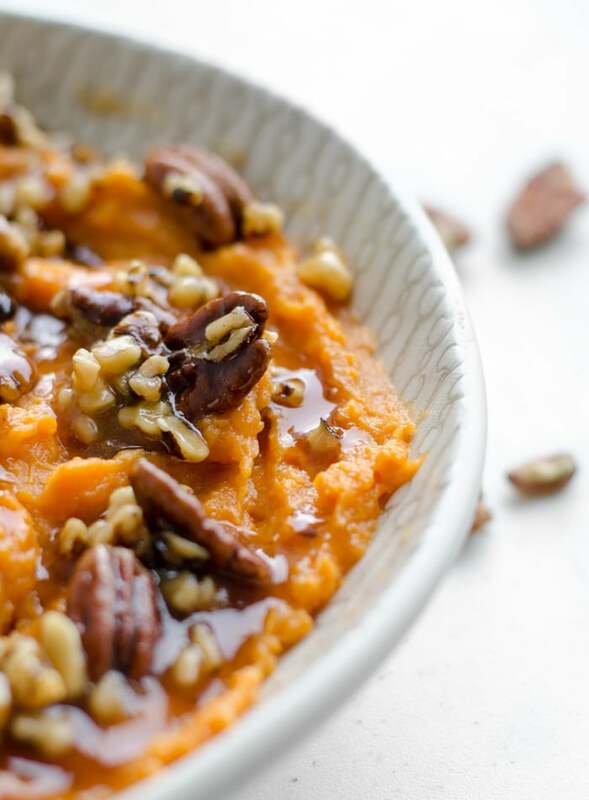 Want to try something a little different for your holiday sweet potato dish this year? 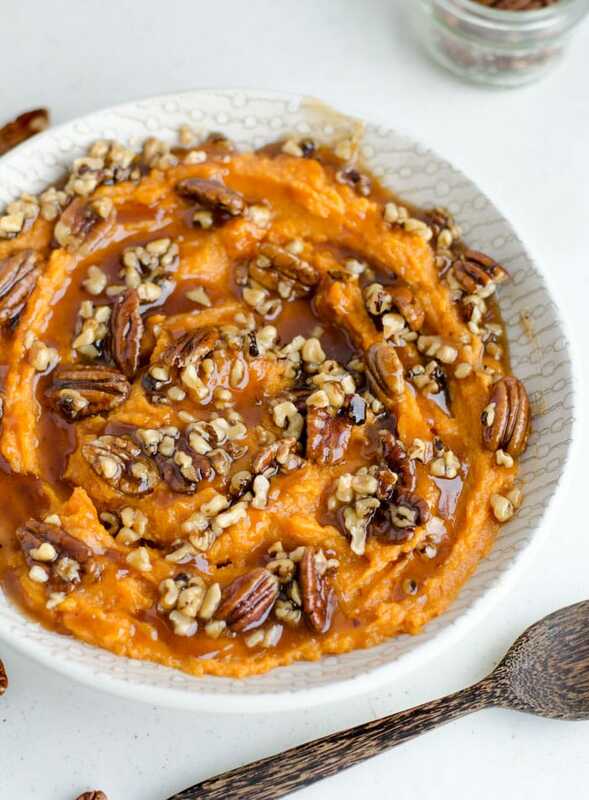 How about extra creamy, vegan coconut mashed sweet potatoes with maple pecan sauce? 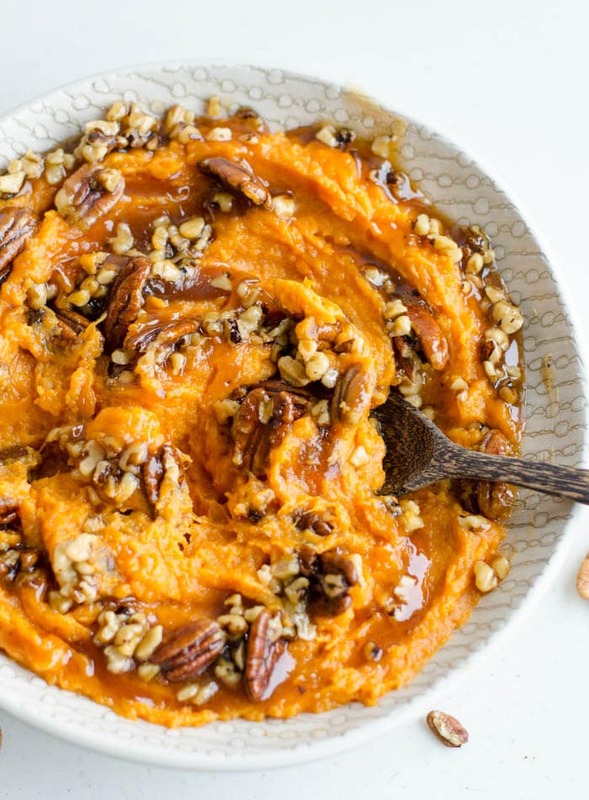 This dish still gives you that marshmallow-on-top dessert-feel of holiday sweet potatoes but instead of marshmallows they’re topped with insanely delicious maple pecan sauce. 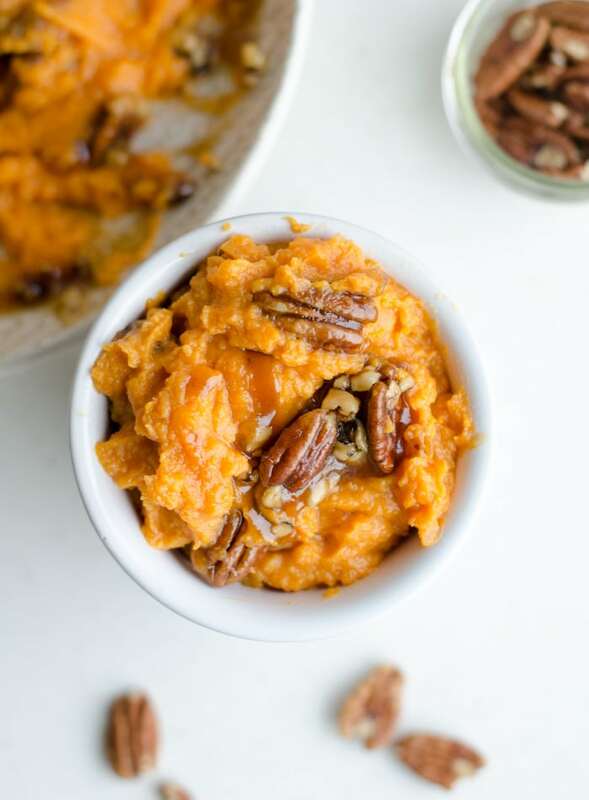 The whipped sweet potatoes also have some cinnamon, maple syrup, sea salt and coconut milk mixed in for a fun coconut twist and loads of cozy, delicious, perfect holiday flavour. To make this maple pecan sauce, you’ll need maple syrup and either walnuts or pecans, or a mixture of both. I used 1/4 cup of each. All you need to do is bring the maple syrup to a boil in a small sauce pan while stirring, then mix in the nuts. Total cooking time should be about 6 minutes. I would recommend making this sauce right before serving but it can be re-heated later on if needed. There are a few ways you can make mashed sweet potatoes but like to bake whole sweet potatoes then peel and mash them once they’re done. If you prefer you can peel them first and boil or steam them until tender, and then mash them up. I find baking them whole to be the easiest because I can just throw them in the oven on their own or with whatever else I’m baking and that way they don’t take up an extra room on the stovetop. If you’re baking them whole, create a few slashes across them with a knife and stick them in the oven just like that. The skin will easily come off once they’re baked. If you have an electric hand held or stand mixer, I’d recommend using it to make the most amazing light and fluffy whipped sweet potatoes. You can also just use a masher but I love the texture the electric mixture creates. For extra decadent holiday flavour, I added coconut milk, maple syrup, sea salt and cinnamon, which is all optional but I highly recommend adding each and every one of those ingredients. SO GOOD. Once the potatoes are ready, make the sauce and pour it over just before serving. 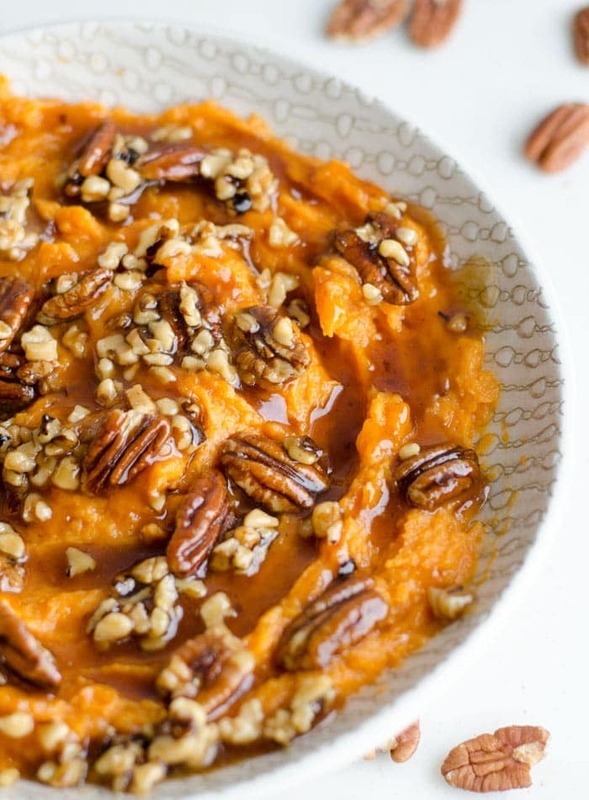 An extra decadent mashed sweet potato dish to add to your holiday spread. 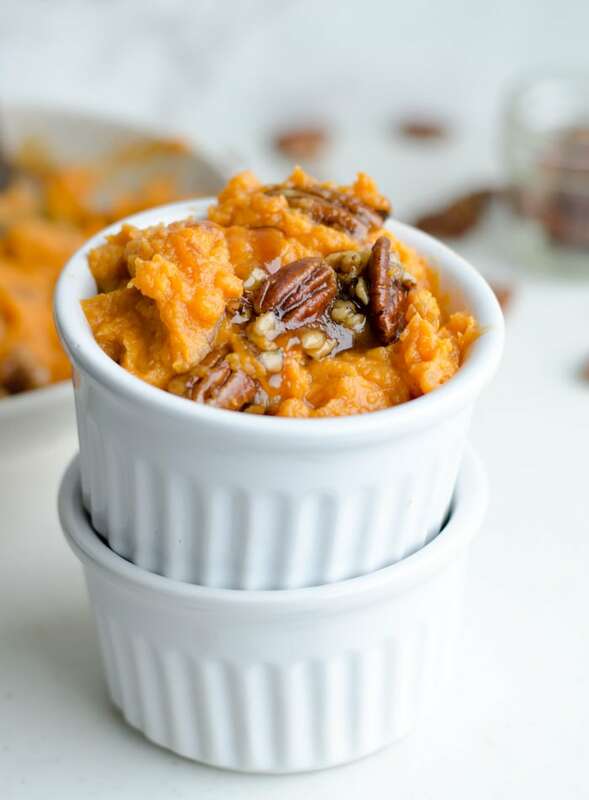 With the added coconut, maple syrup, cinnamon and sea salt, these are not your everyday sweet potatoes but they’re absolutely perfect for Thanksgiving, Christmas or Easter. Top them with the maple walnut pecan sauce for an extra special treat. 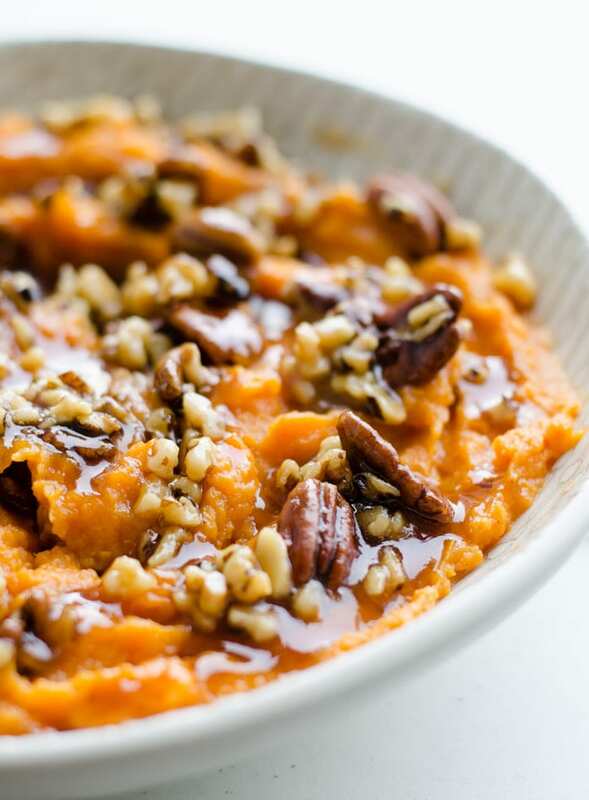 Add the cooked sweet potato, coconut milk, maple syrup, cinnamon and sea salt to a bowl and whip with an hand held mixture or stand mixer until fluffy, about 2 minutes. If you don’t have an electric mixture, no problem, just whisk it all up with a spoon or fork. Once they’re ready, spoon into a serving dish or individual servings. Add the maple syrup to a small sauce pan and bring to a boil over medium heat, this should take 3-5 minutes. Stir occasionally. Add the nuts, bring back to a boil then drizzle over top of the whipped sweet potatoes and serve immediately. To be honest, I’m not sure what I feel about this one. The combination of sweet and savory sounds unusual and certainly interesting. Mind you, I’m not a major fan of sweet, so that might be why. I love the uniqueness though and I bet the dish tastes amazing despite my reservations.